Nellore: The murderous attack on the president of TD student wing, Telugu Nadu Students Federation, Tirumala Naidu in front of the office of the TD Nellore Lok Sabha nominee Beeda Masthan Rao during broad daylight on Sunday afternoon has created flutter in Nellore district. If not for the timely arrival of some women from their households raising an alarm, the nine unidentified goons armed with lethal weapons would have eliminated the TD leader, it is learnt. 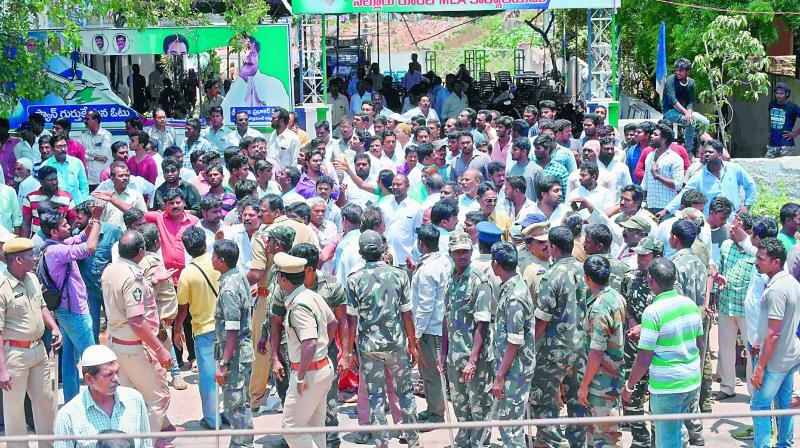 Attacks on a few businessmen after the elections and threats to some individuals for working against the YSR Congress reportedly by YSRC senior leaders during the recent elections has been worrying people. They suspect that Rayalaseema factions have entered Nellore district going by the body language and high-handed behaviour of YSRC leaders. Not to be outdone, some TD leaders had attacked the YSR Congress rural legislator’s office after the assault on Tirumala Naidu and destroyed flex boards of the MLA on Sunday. The MLC and TD district unit president Beeda Ravichandra and Nellore Mayor and TD nominee for the Nellore rural segment Sk. Abdul Aziz have squarely blamed Nellore rural legislator and YSRC nominee for the seat, Kotamreddy Sridhar Reddy, for the incident. Aziz dared Sridhar Reddy to attack him “if he has the guts” instead of targeting people who worked for him sincerely. Condemning the barbaric attack, he said they were also capable of retaliating but it was not the culture of Nellore. He added that TD men were being targeted by YSRC men because of the fear of impending defeat. Meanwhile, Kotamreddy Sridhar Reddy denied any role in the attack on Tirumala Naidu and came down heavily on TD leaders for accusing him. Speaking to media persons here on Monday, he demanded a judicial probe into the incident. He advised the police to take action on those who attacked Tirumala Naidu and his office.